Orlando, FL – Orlando City SC is now unbeaten in their last four matches, three of which were at home. In their last two home matches, the squad has scored seven goals. They had two wins and 14 goals in their previous 14 MLS home games, losing and drawing six times. Dom Dwyer has scored five goals, during this marvelous four-game run. He also leads the league with three game-winning goals this season! Orlando and the San Jose Earthquakes have never earned a win against each other. They’ve drawn their previous three matches. The Lions pounced early, scoring in the 2nd minute. Forward, Chris Mueller scored 63 seconds into the match, assisted by Peruvian national, Yoshimar Yotún. The rookie’s goal set the record for the fastest Orlando City goal ever. He has now scored in three consecutive matches. He also recorded the first assist of his professional career, in conjunction with Yotún for the 2nd goal of the match to Sacha Kljestan in the 35th minute. 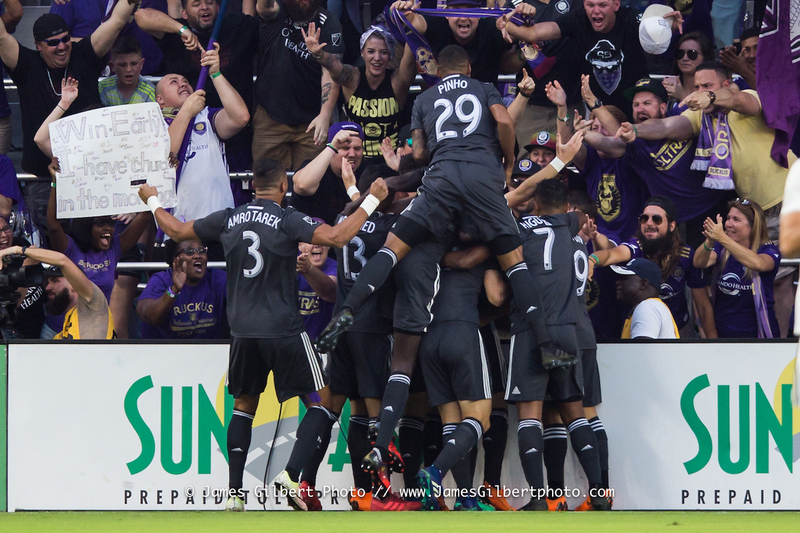 Orlando’s final goal of the match was scored by Dom Dwyer, which was the 100th goal of his career, and assisted by Justin Meram in the 69th minute. San Jose would make a run, and threaten to equalize Orlando, which would’ve made it four straight draws between the two clubs’ matchups with each other. The Earthquakes scored on two successive corner kicks, both goals by Florian Jungwirth. The goals came in the 78th and 90th minutes of the match. The Lions earned a penalty, but the Quakes’ goalkeeper, Andrew Tarbell saved Meram’s penalty shot in the 86th minute. To celebrate Earth Day, both teams rocked those Adidas Parley jerseys as part of MLS’ league-wide Greener Goals campaign, which are made up of recycled ocean plastic waste. It was the second year that City took part in this effort to be more environmentally friendly. Orlando has also won both matches while sporting the Parleys. The match ended with a 3-2 Orlando City win. Next up, the Lions travel to Colorado to take on the Rapids on Sunday, April 29th at 4 PM.